Continued prayers to the family. You were truly an inspiration. May God watch over your loved ones. My sincere condolences to Mrs. Viola, Renee, Linda, Donna, Terri, and the rest of Taliaferro family. Praying that God will bless and keep each one of you and cover you with his love and his peace during your time of bereavement. May God provide his family and friends with comfort now and in the days ahead. He was more than a football star. "A documentary about Taliaferro, titled Indiana Legends: George Taliaferro, was produced by WTIU public television in Bloomington, Indiana. In later years he became a volunteer with Big Brothers Big Sisters of Baltimore, advised prisoners adjusting to society upon their release, got his master's in social work at Howard University, taught at Maryland, was dean of students at Morgan State, returned to Indiana as a professor and special assistant to IU president John Ryan, and helped start Big Brothers Big Sisters of South Central Indiana in Bloomington." His life was more than football and should be honored as well. Rest in Peace. Please accept my condolences. I did not know George personally but as a former athlete, Lawyer and sports journalist keenly aware of his football acumen and character. I only had the honor to meet Mr. Taliaferro once with his daughter Gayle at his home in Cincinnati 2017. He was so welcoming and kind. His mind strong!! I was moved by his humility. Wish I'd taken his autographed book offer, but didn't want to seem like a groupie. Gayle we live and support you! What a great historical legacy. You will always be 1st! 1st quality first in the of those wise enough to love you. Thank you for being a proverbial friend. We will remember you Mr. T and fai.ly you are in our prayers!! What an honor to have met him, to have shaken his hand, to have sat quietly listening as he shared his marvelous history. How blessed we were to have known George Teliaferro. My condolences to Vi and the family during this saddened time. Be of strong courage for the Lord is our Light and our Salvation. My condolences to the Taliaferro family I applause all of the path leaders of our race for opening the doors for other I did not know Mr. Taliaferro personally but I have been told of his greatness and I am sure he will be remembered. God Bless you all. Thank you for paving the way for so many Mr. Taliaferro. May God bless your family and keep them during this time. My sympathies to he family soon no more death (1 Corinthians 15:26). An Honarable Gentleman, A Great Kappa Man. I did not know I was walking among such a giant while at IU. Linda, I have you and your family in my prayers. Have peace for you shall see your Dad again when morning comes. Our sincere condolences to Viola and family. We were truly saddened to hear about Georges passing. Sending our love and blessings. thoughts and prayers are for the family. I will continue to keep you all in my prayers, especially during this difficult time. I am A Member of Sixth Grace Presbyterian Church in Chicago, Illinois. Reverend Dr. David B. Thornton is the Pastor. I am also A Former Member of Church Musician Ship Guild, Inc. (1988-2008). The late Dr. Mildred G. Lewis was The Founder/Executive Director. For your information, I was their Executive Secretary, and Public Relations Director. My condolences are to the family, many, many friends, colleagues and fans of this wonderful nice man Mr. George Taliaferro. May the God of all comfort be with you during this difficult time in your lives because He cares for you. May you find comfort in your wealth of fond memories together. We all look forward to the blessings our impartial God promises us that no one will every look at a person an see the color of their skin. We will enjoy true peace and happiness in a paradise earth. This is a promise from our heavenly Father that will come true soon. A great example, trailblazer, devoted spouse, and very talented gentleman. May God bless him & his family. He certainly has a great legacy. My deepest sympathies to Vi and the family. You are in my thoughts and prayers. He will not be forgotten. Please keep the wonderful memories of him in your hearts and share them with one another especially the younger generation. RIP, George! Thank you for your on-field skills and above all your courage in the face of difficult social times! With heartfelt sympathy. May the God of tender mercy grant the family peace and comfort during this time of sorrow (2Cor.1:2-4). Godspeed George, and thank you for sharing a part of your life with us. Mr. Taliaferro attended Indiana University with my father, Graham Martin. He was a friend of our family. My prayers are with the family. May you find comfort in the dignity and character he showed both on and off the field. Mr. George Taliaferro was a pioneer who paved the way for such greats as Jackie Robinson, Hank Aaron and other trailblazers into American sports. What a legacy for his family to cherish. My condolences for your great loss. George was a very honorable man. The world could use more like him. What a Great Man! My condolences to the family and may the Angel of comfort, hold and keep you in these hard times. We are truly sorry for your loss. Growing up in that time period must have been very stressful for many. Mr.Taliaferro set a good example by not retaliating against those who showed opposition. Notice what it says here in Romans 12:17,18 17Return evil for evil to no one. Take into consideration what is fine from the viewpoint of all men. 18If possible, as far as it depends on you, be peaceable with all men. My sincere condolences to the family for the loss of your loved one. He had a memorable career that he was very proud of. May the many memories you shared and words at John 11:43,44 from the Almight Jah comfort you during this difficult time. I would like to express my deepest sympathies for the loss of your loved one, who will be remembered for his athletic ability and leaving his mark in history. May you find comfort and help in God during this time of mourning. All American football fans salute this brave pioneer in our favorite sport. And, we extend our sincere condolences to his family and friends. 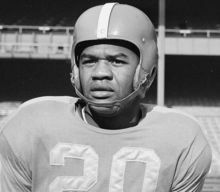 George Taliaferro may have played Seven positions in each game, multi-tasking most skillfully. His prowess, tenacity, dexterity and endurance were unmatched. Psalms 62:11,12. My condolences to the family of this brave man. Not only did he accomplish so much on the field, it was his determination and perseverance off the field that made him so unique. May those mourning find comfort in each other and in God during this difficult time. My condolences go out to the family and friends of this wonderful man, he lived a long and fruitful life. I will miss you George, and May the good Lord be with you. I am so very sorry for your loss. George was a wonderful man, and it was my pleasure to get to know him. My parents really enjoyed sharing meals with him and Vi while they lived at the Barrington. My thoughts and prayers are with your family.